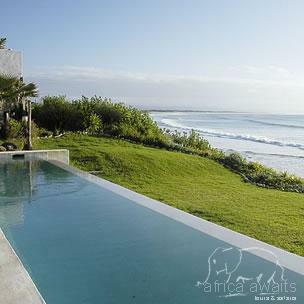 This splendid luxurious 5 star African Beach House nestled in the picturesque seaside village of St Francis Bay offers 5 spacious en suite bedrooms all with uninterrupted views of the majestic Indian Ocean and endless stretches of pristine coastline. 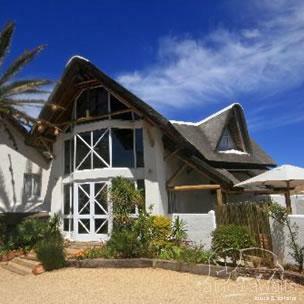 Situated in the exclusive seaside resort of St Francis Bay, this impressive white-walled, thatch roofed haven offers a five-star getaway experience of pure indulgence. From the impressive glass entrance through to the stylish appointed lounge and Restaurant area, the ambience is one of relaxed comfort. The glass fronted Restaurant, with its impressive thatched roof, central fire place and surrounding timber deck, provides the most breathtaking 300 degree panoramic view. Deliciously prepared meals include scrumptious breakfasts, light lunches on request and gourmet dinners, where the emphasis is on seafood. 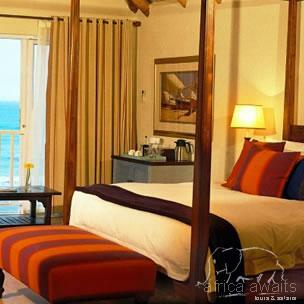 Five spacious en-suite bedrooms, all individually decorated in majestic African Beach Style, come complete with state of the art amenities, air-conditioning, Jacuzzi’s and private timber decks overlooking the beach below. The secluded pool deck and adjacent steam room ensure complete relaxation and revitalisation. Beauty therapy and massage facilities are available on request. With your holiday, safari or business trip from in to The Sands @ St Francis in Eastern Cape.